Mermaid’s Island Grill is a cool restaurant in the heart of Holden Beach that’s known for cold cocktails, good beachy fare, and a laid-back atmosphere that fits in perfectly with the shoreside environment. 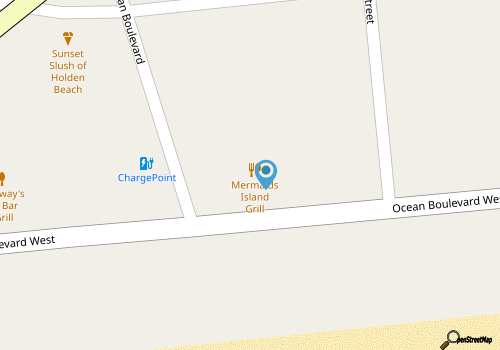 Located just across the bridge to the Holden Beach coastline, this convenient and easy-to-reach restaurant is a good spot for lunch, dinner, or post-beach trip drinks and munchies. The menu features all the coastal cuisine that beach-goers crave, from appetizers and summertime cocktails, to big sandwiches and seafood-based entrees. For a quick snack, patrons can munch on a starter like the lightly fried Seafood Bites that are made with the fresh catch of the day, the Buffalo Calabash Shrimp, or the Maryland Crab Cakes with hand-picked lump crab meat. For something heavier, chow down on an Angus Beef burger, a crab cake sandwich, or even a lamb gyro, or go for a full entrée like the BBQ pulled pork plate with fresh cut fries and slaw, the marinated sirloin beef tips, or the Brunswick catch of the day, which is listed on the daily specials board. With an inviting atmosphere, and plenty of tropical outdoor seating in the summertime, patrons can celebrate the beach with ease at this casual and all-around beachy Holden Beach restaurant.